SIMILIMUMULTRA is a complete, user-friendly and state-of-the art Clinical Utility Software Package for Homoeopathic Practitioners, developed by K.C. Chandran Nambiar, who introduced DIALECTICAL HOMEOPATHY, advocating a fundamental re-building of homeopathy as a higher branch of modern molecular medicine. SIMILIMUM ULTRA is visibly outstanding by its simplicity and comprehensiveness among those currently available in the market. It is the final glorious outcome of more than 40 years of unrelenting learning and dedication of its author to the cause of Homoeopathy. SIMILIMUM ULTRA incorporates a RECOMBIINANT METHOD of repertorization, based on Boenninhaussen’s principles of case analysis. More over, SIMILIMUM ULTRA presents a novel method of COMPARTMENTAL REPERTORIZATION, for those who intend to try the wonderful MULTI-SIMILIMUM METHOD of prescribing as proposed by DIALECTICAL HOMEOPATHY. Embedded Patient Management System : • Most User-friendly Patient Management System- Provides a very simple and relaxed working environment, enabling even those homoepaths with minimum computer skills to use it with ease for their day to day clinical management. • New Patient Registration is very simple. Only minimum entries required. Start work instantly. • Unregistered Cases- Cases can also be worked upon without registering the patient, with options for registering later. •Backup and Restore- safe and easily retrievable backups, without any fear of loss of data even if system crashes. Every time you exit the software, you are promptly reminded to make back-ups(optional). In case you re-install the software, all your previous data will be restored by a single mouse-click. • Search Patients alphabetically, number-wise, diagnosis-wise or using in-built calender tools. • Case Records- Very user-friendly platform for maintaining patient-wise consultation records, prescriptions and follow-up details. • Case Taking can be done either in classical schematic format, Key Note Method, Recombinant Method or using scribbling pad. • Case Taking Forms- Optional for detailed classical schematic case taking. Print options available for case taking forms. Record Symptoms, without much typing, by extracting exact repertorial rubrics into the consultation window, simultaneous with interrogation of the patient. • Case History of a patient may be viewed in a single window, with print options. • Consultaions- Innovative consultation interface, with separate fields for symptoms and prescriptions on same window. Date-wise, and ‘backward-forward’ tools for navigation between different consultations. • Reference Trays- appended to each case record. All works related with a particular patient, such as repertorisation results, materia medica searches, notes etc can be saved in in this handy tray. Print options. • Print options are available for prscriptions, as chits to pharmacist, or detailed prescriptions in the letter-head of the doctor. • Drug List- Search and view the drugs and potencies available in your stock, and add to prescriptions. Drug list can be edited and up-dated. 4 major Repertories – Kent, Boenninghaussen, Boericke, Boger- empowered with multiple ‘Rubric Search’ tools. Repertories are displayed as exact ‘scroll-and-read’ text pages of original books. Rubrics can be added to rubric basket and case record, book-marked or exported to reference trays. You will be convinced that it is not the number of repertories, but the tools and the ways they are used, that matter in homeopathic practice. As some body have put it correctly, “if you really know how to take case and repertorize, you can even work out any case successfully with only the ‘mind’ and ‘generalities’ of Kent Repertory. If you have not mastered the real art of case taking and repertorization, no bulky bundles of ‘modern’ repertories and sofisticated costly softwares can save you”. Note this point. Poweful Rubric Search- Any rubric in any repertory can be located within split-seconds, using single or multiple ‘key-word search’. Search results can be saved into special folders for future use, if desired’. QuickPick- Simple and flexible Expert Tool inked to Rubric Basket, for instant repertorization during busy practice. Eliminate drugs step by step using selected rubrics, and find your similimum at fingertips within seconds . 25 Customized Repertories- Clinically important selected rubrics from major repertories are customized into special groups. Can be used as specialized repertories. Work Sheet- An innovative platform for for pre-repertorization preparation such as combining and grading and re-arranging of rubrics, for ensuring better output. Combine Similar Rubrics- Advanced options for selecting similar rubrics, even from different repertories and combining to form a single rubric, thereby incorporating all probable drugs, same time avoiding the chances of repitition and over representation. An important tool to minimize errors in repertorization. Combine with Upper Level Rubrics- Lower level particular rubrics can be combined with their upper level general rubrics, and converted into single rubric, while extracting from repertories, to ensure correct repertorization resuts, by avoiding undue over-representation of same drug. Grade Rubrics- Innovative tool for detailed classical grading of rubrics into uncommon, common, generals, mentals, physicals, particulars and so on, to ensure perfect repertorization results. Weightage marks automatically assigned according to the grades of rubrics. • Totality Method: Find similimum by classical totality method, using any of the protocols such as Using all Symptoms, Using Selected Symptoms, Using Uncommon Symptoms, Using Uncommon Mentals, Using Uncommon Physical Generals Etc. Options for adding weightage marks assigned according to grades of symptoms. Result can be displayed and saved as charts, and summary could be exported to Reference Tray of the patient. • Elimination Method: Elimination method also can be done using any of the protocols such as Using all Symptoms, Using Selected Symptoms, Using Uncommon Symptoms, Using Uncommon Mentals, Using Uncommon Physical Generals Etc. The most efficient way of reaching a single remedy, through step-by-step elimination of drugs using the selected symptoms. • Combined Method: This is a revolutionary innovation from similimum team. Hailed by prominent masters of repertorization. Totality Method and Elimination method are combined into a single strategy, thereby effectively avoiding the inherent weaknesses of both methods. The result will be exact similimum. The art of repertorization is finally evolving into perfection! • Compartmental Method: For those who use multiple drugs for their patients. Makes their way of prescribing more systematic and rational. Symptoms can be compartmentalized into different groups, and repertorized that way. Let us have a try! • Shoot-out Method: From a comprehensive list of drugs, shoot-out step-by-step, using selected rubrics, until a single drug remain alive. A funny way of finding similimum. Repertorization becomes a real, intelligent game! • Punch Card Method: Here is the user-friendly digital version of the time-tested Punch-Card repertorization. Select the rubrics, instantly prepare punch cards, and repertorize. See the difference! • Brick Column Method: Rubrics are represented by bricks, colored according to grades. Build columns of bricks against each drug, and the most towering column will represent the similimum. Very beautiful graphic interface and handy tools. • Reverse Gear Method: A platform for analyzing and comparing the results of different methods of repertorization, for final selection of similimum. • Re-combinant Method: Digital version of Bonninhausen’s method of case-taking and repertorization. This platform is by itself, of more worth than this whole software! Materia Medica- 20 important Materia Medica works in full text, in easily readable interfaces, with key word search and bookmarking options. Options to extract selected text into NoteBooks or Reference Trays. (Hahnemann, Kent, Boericke, Boger, Nash, Clarke, H.C.Allen, T.F.Allen, Guernsy, Lippe, Anshutz, Hering, Cowperthwaite Etc., Etc). Synthetic Materia Medica: A wonderful, imaginative and authoritative materia medica study material, synthesized through drug-wise and chapter-wise re-arranging of rubrics of Kent Repartory. This monumental work by itself constitutes more than 20000 thousand printable pages. Tools for comparative study of drugs and rubrics also provided.  Clinical Utilities- Highly helpful in successful day to day clinical work. Following Clinical Utilities are available. May be customized anytime by users, incorporating new data. • Normal Clinical values: Normal values of various Body Fluids, Cerebrospinal Fluids, Chemical Constituents of Blood, Function Tests, Metabolic, Endocrine, Renal, Haematologic Values, Stool, Urine, Lipid Profile, Leucocyte Differentials Etc. • Height-Weight tables: Detailed Height-Weight table of infants, girls, boys, women and men. • Laboratory Tests: Details of Indications, Test methods, Physiology, Normal Range and Interpretation of various laboratory tests belonging to categories such as Biochemistry, Haematology, Immunology, Microbiology, Hormone Tests, Sputum Tests Etc. • Clinical Relationships: Table of Clinical Relationships of important homeopathic drugs, such as Complementary, Antagonistic, Durations of action Etc. • Constitutional Symptoms of Drugs : Constitutional symptom pictures of major drugs, compiled from major materia medica works. Very useful for constitutional analysis and prescriptions. • Diagnostic Tables: Various Diagnostic tables and charts from Practice of Medicine, containing valuable information helpful in the process of disease diagnosis. • Homoeopathic Specifics: A wonderful tool for successful day to day clinical practice. Specific uses of homeopathic drugs with recommended potencies. Collected from works of great masters of homeopathic therapeutics. • External Applications: External uses of various homeopathic drugs, with detailed guidelines for preparing and using external applications. • Mother Tinctures : A reliable practical guide to mother tincture therapeutics in various clinical presentations. • Stock Register of Drugs: Maintain Stock Register of drugs and potencies available in your pharmacy. Instantly verify the availablity of drugs before making a prescription. • Purchase Order Forms: Prepare and print purchase orders of drugs with potencies, without typing. Add to purchase list whenever your stock of a particular drug seems to exhaust. • Medical Certificates: Form for preparing and printing medical certificates to be issued. • Fitness Certificates: Form for preparing and printing fitness certificates for your patients. • Letter Pads: Prepare, print or save letters and prescriptions in the user’s letter heads. Select or change fonts and colors of the letters to make them appealing. • Bills and Vouchers: Prepare and print vouchers and bills related with your daily transactions. Personal Organizer- A complete, built-in Personal Organizer, with reminders of appointments, to register and manage various day-to-day appoitments during busy practice. Effectively plan and organize not only your clinical practice, but your whole days and years! Analysis of Clinical Performance- Tool for periodically evaluating and comparing patient turn-up in the clinic to identify deficiencies and take remedial actions. Ready Reckoners- 31 wonderful clinical compilations from Boericke Materia Medica, highly helpful in making instant prescriptions for various pathologic conditions. Note Book- An important platform with versatile utility. Selected portions of texts from Materia Medica, Repertories and Reference Books can be exported to NoteBook, edited and saved in special folders. Articles available from internet or other digital media also may be imported and saved here. Print options available. Handy tool to scribble down anything and everything. Its utility is limited only by the horizons of one’s imagination. List of Diseases- Prepare a customized list of diseases. Add diagnosis to each case from this list. Then search and group your patients according to disease category. On-screen Tips- An innovative learning tool. Even while sitting idle in front of your computer, you will be in the process of learning. Selected quotes, texts and clinical tips may be added to this platform, and viewed on the desktop as flash text displays. For an imaginative user, this platform offers a wonderful learning experience. I have this in my college , purchased recently for Repertory department. Its beneficial !!!! I recomend Similimum Ultra Software, it is definetly helping me in my practice and also clinical utility. So guys just spend Rs 6000/-, the changes in your clinic will be self evident. Nice sir, your software is priceless gift for our profession. my student Dr Sayali will contact you for software. Similimum Ultra A Best Homoeopathic Repertory Tool. Since 2008 I was tried well known software’s and lost my money, as they have lot of errors hence i started manual working with repertory books. Lastly i decided to loss another Rupees 3000 /- and avail the Christmas discount offer and Buy SIMILIMUM. After going through SIMILIMUM i found it very very useful tool. I am very much Thankful to Chandran Nambiar sir for developing such a wonderful software for the serious practitioners of homoeopathy. Similimum has the basic repertories. the worksheet is very innovative. grading the rubric before repertorization is also innovative. the repertorization methods are also innovative. card repertorization methood also use wonderfully. i am using it since 4 days and found very useful. i am 100% satisfied by Buying SIMILIMIM Ultra. so don’t get confuse, get it, and use it. Best of Luck. “Dear Chandran, after using your software for a few weeks I want to tell you that I am really excited about the varieties which it offers in working out the cases. Even though I read the users manual before ordering there are so many things in it to discover that I am really amazed about the possibilities. It gives new impulses to my work and I am really thankful for this. Hello sir, i have been using this software since past one and half yr or more.This is really a good software, easy to use and very user friendly also very effective in finding the similimum. There are lot of options which can be used for repertorisation. various repertories available makes it really useful. The patient database is also very good which allows fast access to the previous patients and their follow ups .I thank Chandran Nambiar sir for making such a wonderful software. Thank you sir. Hi dr, thank you so much for ur beautiful software. Even though i’m started using this only a few days back,really impressed with it esp.the repertorisation. The combine n grading rubric and work sheet are all among my favorite tools. And, ofcourse, still discovering its possibilities. First of all let me Thank Dr Chandran Nambiar for Making this user friendly SIMILIMUM Software for us ( Homoeopaths) . For the last 7 yrs I am using this software, mainly the patient management data base Comfortably.Once or twice I had problem with my Operating sysytem,but tell you that i diidnot loose any data because the back up is very easy & comfortable.I strongly recommend my fellow doctors to use this software. I have been using similimum ultra for last 1 year..its very easy to use.everything is simplified.i have recommended the same to my friends and now nearly 10 of them are using the software with great satisfaction…thanks to chandran nambiyar sir..
“I have been publishing the internationally circulated journal QHQ and during that time I had the opportunity to come across five different homoeopathic soft wares. Until 2003 I used five software and I dumped each of them within a short time. From 2003 onwards I began using Similimum and still I am using the same. I don’t know why I couldn’t change from this to any other. May be because I realized that Similimum Ultra is apt for my mode of practice. Even though I don’t repertorise all cases, I had done 18000 until now with Similimum Ultra. Even in acute case it can be done without saving or registering a patient. I think that Similimum Ultra is a perfect one for a busy practitioner and it can be handled very easily with many search options. This stands premier among the other homoeopathic software because each and every homoeopath can repertorise according to their own methods”. It is seven years (from 2004 February onwords)Iamusing the omoeopathicsoftware SIMILIMUM developed by K.C.Chandran Nambyar.It is very useful to workout cases and find the appropriate remedy for the patient In the magazine Homoeopathic HERITAGE published by B.JAIN publishers there had been a column ‘crack the case’ a contest conducted by a panel of experts to find the most similar remedy for the given case.I used to participate and most of my answers were correct.For example:-2006 February issue out of 2659 entry only 38 were correct,March issue out of1378 entry only 6 correct April issue 2791 entry 62 correct June issue 2553 entry 83 correct.In all the above cases Icould find the correct remedy by the aid of this software .So my request to all homoeopaths is to be familiar with this easy to handle software SIMILIMUM ULTRA which is the latest and upgraded version.Thanks to Chandran nambyar.Icongratulate you. 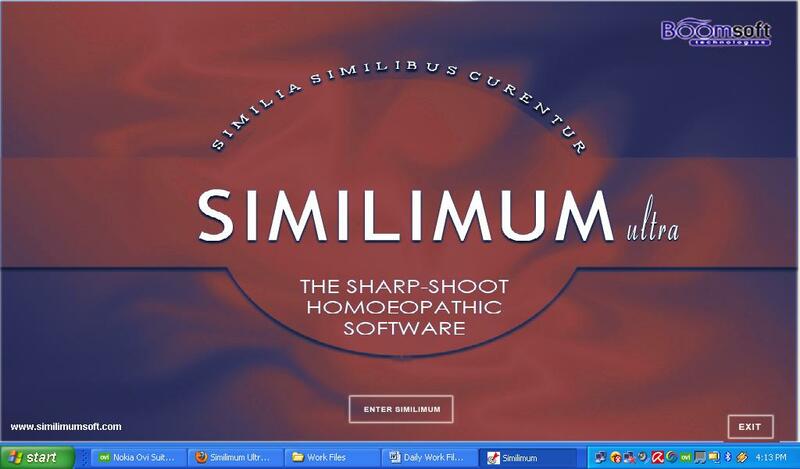 I am using similimum homeopathic software in my daily clinical practice with success. I found it user friendly, simple and accurate. It is loaded with number of reliable repertories like Kent.Boenninghausen,Boerick e,Boger and many customized repertories. They cover almost all the symptoms of every disease. I am very much impressed by its fast search system. You can locate simultaneously any rubric, in any repertory and all the popular materia Medicas. Once the symptoms are recorded, repertorization can be done by various methods with accuracy and you can also prepare combinations with the help of its unique facility, not available in any other software. Beside this it has many other facilities which I could not find In others. It is complete in every respect and not less than any good homeopathic software available, with comparatively less cost. Undoubtedly, for a busy practitioner “Quick Pick” repertorization is a grand facility. I am using the similimum ultra soft ware. It has the best patient management system. I enjoy using the software. BOERICK’S REPERTORY VERY MUCH USEFULDear Sir, I am very much thankful to you, because of you I am started using Boericke’s repertory in my practice. I am feeling very sad as I ignored such a beautiful repertory which has clinical data, I am using this repertory with great results in my practice. In SIMILIMUM ULTRA repertories are arranged beautifully as it is very much convenient to use. Thanks again. Similimum Ultra is my very first approach to Boericke’s repertory, and I am excited about its use in daily practice. Started using similimum ultra nice piece of work done which shows clarity of mind and clarity of thoughts of NAMBIAR sir the software shows that it is the outcome of love towards HOMOEOPATHY. I have sent you PAY PAL payment request to your mail id. If you are interested, please make payment. I want to buy this software how can it be purchased and what is the method of payment. is it possible to get a trail version to see it effenciency. We at Boomsoft Technologies want to express our gratitude to the homeopathic professional community for their warm response being extended to “Similimum Ultra New Year Early Bird Offer 2012”. As per this wonderful offer, you get Similimum Ultra Software at a reduced price of Rs 3000 per copy, instead of the regular price of Rs 6000. Grab this 50% discount offer with out any delay. Offer will be closed once the set target of 1000 is achieved. Kindly note, this ‘small’ price does not mean Similimum Ultra is a ‘small’ software. For this throw away price, you are getting a complete clinical utility package consisting of Patient Management System, Basic Repertories, Innovative Repertorization platforms, Major Materia Medica works, Book Shelf and a whole range of clinical utilities that you could have never imagined even in your wildest fancies regarding a homeopathic software. Is Similimum Ultra compatible with Windows 7 Ultra. C/o: DR. H. C. SHUKLA.